This recipe was sponsored by Community Coffee but all opinions are my own and I appreciate your support! I get so excited when the time finally comes to enjoy pumpkin coffee again for the season. There’s nothing I like waking up to more than the scent of pumpkin coffee brewing in my kitchen and making breakfast on a Sunday morning! 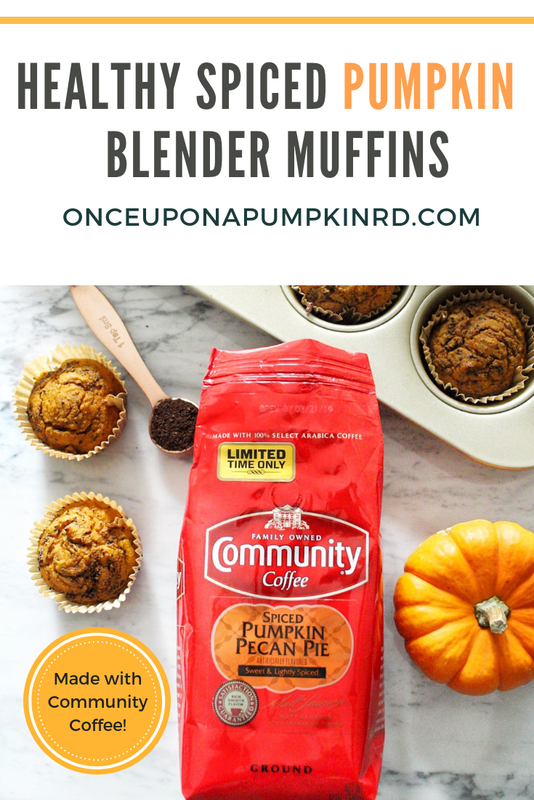 The perfectly spiced and bold spiced pumpkin pecan coffee from Community Coffee is new this year and I’ve been having fun sipping on it and experimenting with in recipes like these healthy spiced pumpkin blender muffins! What I especially like about it is that is that the coffee on its own is not overly sweet. While I’m an equal opportunity pumpkin lover, I want my pumpkin coffee to have a subtle pumpkin taste that stays true to its real coffee flavor and this one that’s spiced with hints of pecan does just that. Its full body flavor definitely extends to anything you incorporate it into which is why if you’re a coffee lover, I know you’ll also love these pumpkin muffins! They are only lightly sweetened with maple syrup and made with oat flour. The greek yogurt gives them that extra moist muffin texture, and extra points if you use a pumpkin flavor! I love how light and airy they taste, and were extra delicious with a little almond butter spread on top! Healthy spiced pumpkin blender muffins are the perfect way to celebrate National Coffee Day tomorrow, while sipping a cup of coffee of course! I know I’ll be making these muffins every fall from now on and in honor of the coffee holiday Community Coffee is offering 30% off online purchases with code “COFFEEDAY2018”. Be sure to get in on the fun and stock up with the flavor of the season! If you’re a die hard pumpkin lover like me you might also like this recipe for healthy tahini blondies, and this mini guide to 50 ways to use pumpkin puree you never thought of! 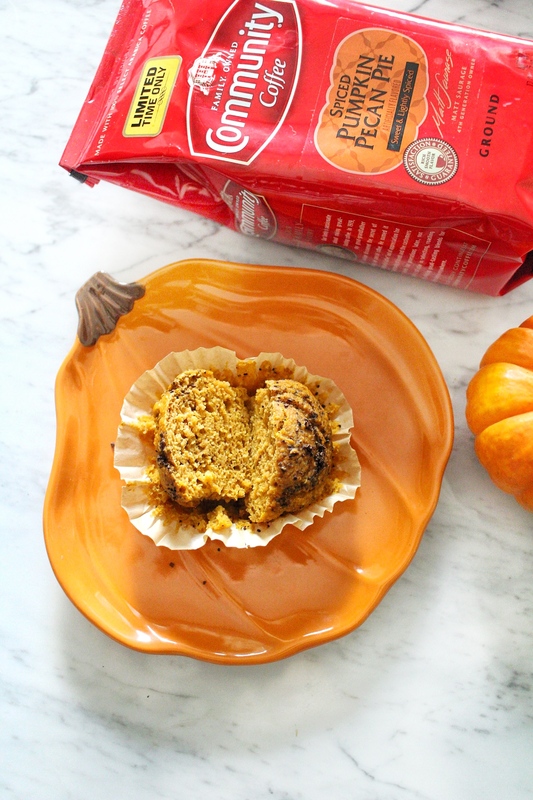 Enjoy the taste of pumpkin and coffee in these super simple spiced pumpkin blender muffins. Perfect for chilly fall mornings enjoyed with a cup of coffee or freeze and pull them out whenever a craving for a lightly sweetened treat with bold pumpkin coffee flavor strikes! Preheat the oven to 400 degrees F and grease a muffin tin with coconut oil or use liners. In the jar of your blended add the oats. Blend until oats resemble the consistency of flour, about 1 minute. Add the pumpkin puree, eggs, yogurt, maple syrup, coffee grounds, baking powder, baking soda, vanilla, pumpkin pie spice and salt. Blend until smooth, about 2 minutes. Pour pumpkin muffin batter into prepared pans. Lightly run water over a toothpick and dip it into the additional coffee grounds. Swirl the toothpick around the top of the muffin batter to create pumpkin coffee swirls. Bake for 15 minutes, let cool and enjoy with a nice cup of pumpkin coffee! You can substitute gluten-free oats for regular to make this recipe gluten free. Pin these healthy spiced pumpkin blender muffins!